From beer to golf, wellness to wine, river cruise lines are embracing themed sailings with the same passion their passengers show for these special interests and are consequently rolling out even more themed cruises for 2015. AmaWaterways grew its themed departures by nearly 15% this year compared with last, in response to guest demand, said Kristin Karst, executive vice president and co-owner. In keeping with that demand, for 2015, Ama has introduced a beer-themed cruise, which will include visits to breweries, tastings and educational discussions. 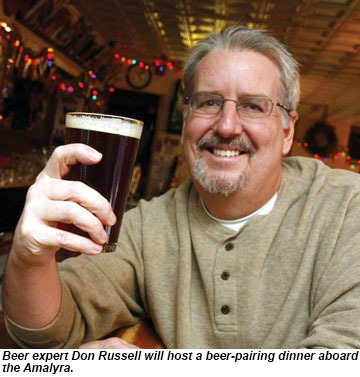 There will also be a beer-pairing dinner presented by beer expert and writer Don Russell. There will be two Beer Cruise departures next year: one on March 31, sailing in the Netherlands and Belgium aboard the 148-passenger Amalyra (starting at $2,599 per person), and the other on Dec. 14, sailing the Danube aboard the 164-passenger Amaprima with stops in Amsterdam, Antwerp and Brussels (starting at $2,899 per person). Some of Ama’s other themed cruises for 2015 include a seven-day Art Illumination Cruise through France’s Normandy region, with visits to Monet’s house and garden in Giverny, and Van Gogh’s former home in Auvers-sur-Oise. Departing Aug. 13 onboard the 150-passenger Amalegro, the Art Illumination Cruise starts at $3,599 per person. Ama’s wine-themed cruises have become so popular that the line now dedicates an entire brochure to its In Celebration of Wine cruises. For 2015, the company will also host jazz, Jewish heritage and chocolate-themed cruises. This year, Avalon Waterways increased its special-interest cruises by 30%. Among its 2015 offerings is an author-themed cruise featuring “1,000 Places to See Before You Die” author and Travel Weekly contributor Patricia Schultz. The seven-night Author Cruise departs Aug. 9, and will include lectures hosted by Schultz. During the Danube cruise from Budapest to Nuremberg, Germany, aboard the 166-passenger Avalon Expression, passengers will also have the opportunity to have Schultz sign copies of her books. Additionally, Avalon is adding an opera-themed cruise to its lineup of music-themed cruises for 2015. Avalon’s roster of themed cruises now includes art, beer tasting, culinary, holiday markets, golf, jazz, Jewish heritage, music, wellness and wine. Avalon will have a total of 80 themed river cruise departures in 2015. Other river lines offer special-interest departures, as well. Uniworld has family, epicurean and holiday-themed cruises; Viking has a comprehensive offering of holiday cruises; and Tauck offers music- and art-focused sailings and holiday market cruises.